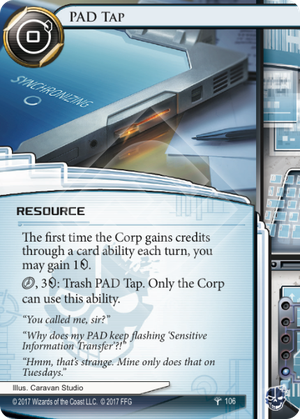 The first time the Corp gains credits through a card ability each turn, you may gain 1credit. click, 3credit: Trash PAD Tap. Only the Corp can use this ability. "Why does my PAD keep flashing 'Sensitive Information Transfer'?!" "Hmm, that's strange. Mine only does that on Tuesdays." Does PAD Tap trigger when the Corp takes credits from a card like Adonis Campaign? No. The Corp "takes" credits from Adonis Campaign. A sleeper card in an absolutely stacked datapack, PAD Tap is drip economy with an interesting trigger: it pays you when your opponent gets paid. Flavourfully Criminal, this card’s best-case scenario is that it pays you 1 on your turn and 1 on your opponent’s turn. To top that scenario off, you’ve got enough Fall Guy installed to dissuade the corp from even thinking about trashing these (unfortunately PAD Tap does not combo with Wireless Net Pavilion). Corp’s Turn: Commercial Bankers Group / Hostile Takeover/ Standoff / All The Transactions! Corp’s Turn: All The Clearances! As you can see, the above lists aren’t fully comprehensive but they cover quite a large majority of the popular economy options available today. At one influence, PAD Tap continues the blue trend of being under-influenced (see Aumakua) so you can splash for it with relative ease. There’s one more consideration to be made though and that’s that it comes with a pre-built trashing option. Given that a smart corp player will trash PAD Tap knowing the potential money their deck could make the runner, PAD Tap has a great home in the economy denial archetype. One last thing: PAD Tap doesn’t trigger when the corp clicks for credits but if you’re at the point in a game where your opponent is forced to do that, you as a runner have probably already won.